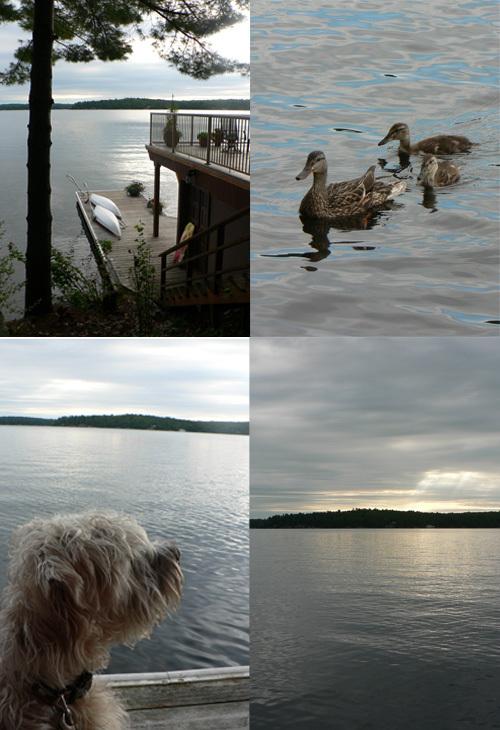 This past week, my parents moved from their lakeside home on the shores of Lake Muskoka, a special place that has been part of our family for about thirty-five years. They purchased the cottage when I was in my early twenties. In those days, I worked and lived in Toronto so I would often go there on weekends and during my summer holidays. When my parents retired, they rebuilt the cottage into a beautiful four-season residence and moved into it on a permanent basis. Although it had changed completely from its simple beginning and use, we continued to refer to it as 'the cottage' in our family. I moved to Montreal when I was in my early thirties. The eight-hour drive from Montreal to Gravenhurst meant that visits were much less frequent but the cottage continued to be part of each summer. Emma and Chloé, now 20 and almost 16, got to know it from when they were babies. I had really hoped to go and help my parents with their move and to say goodbye to the cottage but, by the time Chloé's final school exams were over and we could have travelled there, it was too late to be of help. If you are on Instagram and Facebook and noticed a reduced presence on my part in the past couple of weeks, it was because I was barely looking at my feed. Every time I saw a photo posted by a family member from the cottage, I would start to cry. So I stopped looking. I'm sorry if I missed other things. As one friend noted, not being there means that my memories of the cottage will not be of its packed-up, empty state but the way it was over the years. Among the layers of things I will remember will be swimming out to a big submerged rock with my younger sister, Karen where we could stand and dive--'our rock' we called it. I'll remember laying on the dock on my stomach with Emma and Chloé when they were little, catching minnows in a fish net, observing them and then putting them right back in the lake. I'll remember the camaraderie and group nuttiness of the cousins--Emma, Chloé, Duncan, Mac, Katie, Erica and Sydney. I'll remember the beautiful sunrises and the late-night stars. Falling asleep to the lapping sound of the lake and the occasional haunting call of a loon. 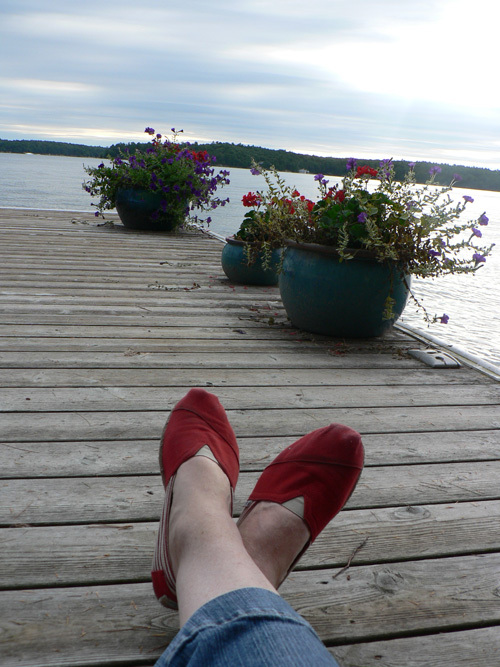 Reading books sitting in the big Muskoka chairs on the dock with a cup of coffee or a glass of wine. The boat rides to get ice cream and long walks with the family dogs. I'll remember the gatherings, the chats and the laughter. 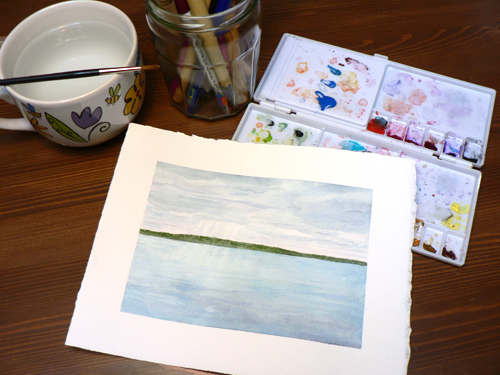 The cottage and its gentle natural surroundings have also figured frequently in my art over the past thirty-five years. 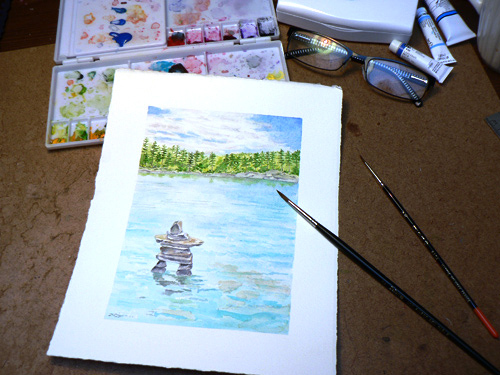 I have painted many Muskoka scenes, some in oil and then, in recent years, in watercolour. I spoke to my parents yesterday. They are in their new home in town, a place that is more suited to them now. They said that the family who bought the cottage seems to really love it so it is in good hands. I have managed to write this blog post without crying so that's progress. We will be visiting my mom and dad's new place sometime soon. As for the cottage memories, they will always be ours. I totally understand your feelings, my friend. It's not completely unrelated but my feelings are almost the opposite. This year we are selling the summer house that my father had inherited in 2000. He spent much of his money / my parents' money, and tons of his time (given that this house was 3 hours away from where they lived) to make renos etc. This house was previously owned by my paternal grandparents, who had no love or care in their hearts. I spend several summers in this house, and several querels occured there. I am RELIEVED to see this house get out of our hands & history. I'm SO ready to turn the page. See, practically the opposite as your story. But we both need to turn the page & see the future, while remembering the best moments of the past. Yes, some homes really get into our hearts, when they are full of memories! 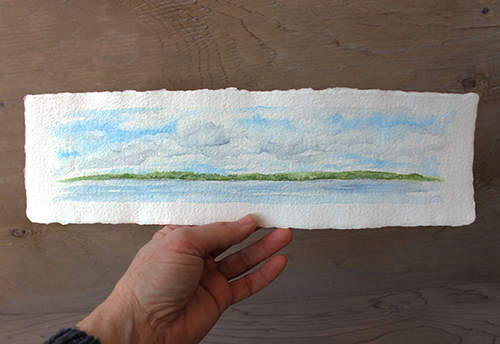 I loved reading your story of the cottage! I could just feel the precious times you have savored there. Thanks for sharing! My husband and I had a custom home built in NM, when our family was young. I had worked as an interior designer, and hired a builder I had heard only good things about. The entire process was a dream come true for me. Our kids have fabulous memories of their young childhood there. We had to move to AZ in 2003, for a job change for my hubby ( I was a stay home mom), and each time we have gone back to visit family and friends, I was the only one who could even bear to drive by! Yes, so many treasured times in that home. The last time I went by, the street (kind of country-ish, no sidewalks) was lined with the tall, branched Black-eyed Susan flowers that were from seeds my daughter and I gathered from ours in our own yard and scattered on a walk, they had finally bloomed! I showed her, and we both cried bittersweet tears.